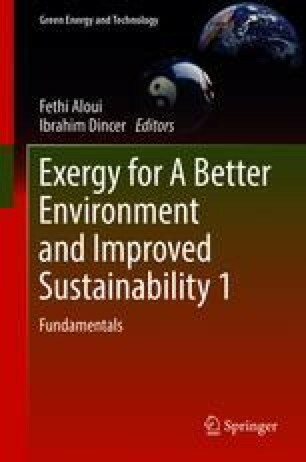 This comparative study focuses on energy, exergy, and environmental analyses of parabolic trough solar thermal power plant working on four different fluids. Two of the four fluids used are nanofluids, aluminum oxide (Al2O3) and ferrous oxide (Fe2O3). The other two fluids are glycerol and Therminol 66 which are oils. Two operating parameters, ambient temperature (T0) and solar irradiance (Gb), are varied to observe their effect on the heat rate produced, net power produced, energy efficiency, exergy efficiency, and environmental impact of parabolic trough solar thermal power plant (PTSTPP). The results obtained show that the energy and exergy efficiencies increase by increasing the solar irradiance. The energy efficiency of parabolic trough solar collector (PTSC) running on four different fluids, aluminum oxide, ferrous oxide, glycerol, and therminol, increases from 52.53% to 79.29%, 52.2% to 78.65%, 52.53% to 79.15%, and 53.17% to 80.13%, respectively, with increase in solar irradiance from 400 W/m2 to 1100 W/m2. The exergy efficiency of PTSC for the tested fluids increases from 24.68% to 41.91%, 24.64% to 42.3%, 24.67% to 42%, and 24.72% to 41.33%, respectively, by increasing the solar irradiance. The net power produced by parabolic trough solar thermal power plant (PTSTPP) is found to be increasing from 76.55 to 81.51 kW, 74.25 to 79.17 kW, 76.08 to 81.03 kW, and 100.2 to 106.5 kW, respectively, with increase in ambient temperature from 275 to 325 K. The exergo-environmental impact index for the four fluids decreases from 3.379 to 3.072, 3.419 to 3.102, 3.388 to 3.079, and 2.435 to 2.202, respectively, by increasing the ambient temperature from 275 K to 325 K. It was observed that the use of nanofluid enhances the net power output of the solar thermal power plant. The analyses also show that increase in ambient temperature and solar irradiance considerably affects the exergetic efficiency and environmental impact of parabolic trough solar thermal power plant. Klein S. A. F-Chart Software (1975): engineering equation solver. http://www.fchart.com/ees/ (1975).